Back in the "olden days" (2003) when very few people had digital cameras and even fewer had any that were even semi-decent, Mark asked me to take some photos of him for the album that he was in the process of recording at Offbeat. I gladly helped out and this is the photo that he ended up using on his front cover. We tried several locations on the River Esk close to Rosslyn Chapel. 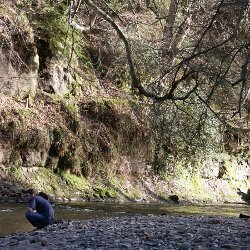 But it was as we were walking back that Mark was crouched down by the Esk playing with the pebbles, that I shouted, "Don't move!" I quickly set up my tripod and took the shot. It was exactly the sort of thing that Mark was looking for. 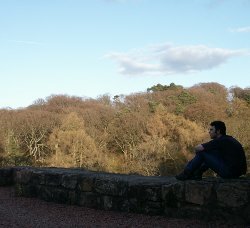 Recorded back in 2003, The Insignificant Man was, and still is, one of my proudest achievements. When I listen to it now with a more 'mature' ear I can still appreciate the sentiments that I was trying to convey - Peace, Love & Hope - and sometimes laugh at my naivety when I think of how I used to believe that an album - my album - could help make the world a better place in some way. "I'll be spending a week (not nearly enough time!) with the Blackfeet Indian Nation here in the US, in Montana ... and your CD will be my company. I am going alone ... which I believe is essential in our spiritual growth ... to discover it by our own means ... to listen to what Mother Nature has to tell us. So, know that your music will be listened to by the mountains & glaciers within the Blackfeet Indian reservation ... by someone searching for her meaning amongst all of this." "I stumbled upon your website today ... never having heard of you before this very hour! I've listened to the music you have up on line, and I can't begin to tell you how incredible it is that I found it at this moment. I won't go into details. I have a feeling that most people who write to you about your music have pretty much the same things to say as I do in regard to nature, earth, & spirituality. so I'll save you from hearing it once again! I just wanted to drop a line & say that I'm very excited to get this CD & hear the complete piece. Thank you for taking the time to make your thoughts into music. Even from what I've heard, just knowing that someone else out there shares my questions & thinking on some level really helps me. Thanks! :)"
"I've had your CD in the car and I've noticed that it's really great music for driving. I love the personal nature of the songs, they feel very honest. It's refreshing to hear some songs that actually have something to say - a rare thing these days!" "I stumbled across Emunah yesterday so I checked out your site and read your lyrics. Thanks. It's nice to know I'm not the only one who thinks like me and that someone else out there gets it :-)"
"Just a brief note to inform you that Susan found the words of "Love is all there is" a real and present comfort during her recent bereavement. I played it to her following me relaying my experiences to her following the death of my father. The up shot was that I was attempting to get across to her the message that the tie of love survives the point we call death and in some case it even increases that bond. The title of your song came to me and I used the title to close my talk, I then played the song and with that aspect in mind the words were perfect ... Thanks"
Receiving words like these mostly from people that I have never met nor had any contact with was really quite something else. It goes to show how powerful music can be and that when you put something out there for people to hear you just don't know what effect it is going to have. The Insignificant Man itself is soft-rock in genre. There are both electric and acoustic guitar songs as well as two piano tracks. My personal favourite song on the album is "Remain so Sure" so if you've got time check it out! You can hear more of my music on my MySpace page. Nowadays I write more acoustic songs than anything else, and some of these have featured on another album recorded in 2005 titled "The RoseLine Connection" by John Sutherland and his son Issac, which is now in very limited supply. This particular album was the first album ever to be recorded live inside Rosslyn Chapel of "The Da Vinci Code" fame. The songs were recorded under the "cubes" with microphones setup all throughout the chapel to pick up on the different resonances bouncing off the walls. That night was another of my most memorable moments in life. As for more recent recordings, back in 2006 I returned to the Offbeat studio to record a one-off song titled "Without Warning." In 2010 this is due to be released on an upcoming album showcasing the Offbeat record label artists and will feature alongside big names such as Tam White who also records at Offbeat. Once it's ready I'll speak nicely to Gav to see if he can update this web page! ... for UK £5 plus £2 postage and packing. This will go directly to Mark's PayPal account and he will then dispatch album to you. He'll even sign it - although, that does mean unwrapping the cellophane to do so! If you'd like to get in touch with Mark directly, then please click here (not on the "Contact Me" link on the left). All music is © Copyright Mark Naples 2003. Mark is now working on a new project called Temple of Mysteries, where you can find out all about Rosslyn Chapel, The Stone of Destiny and The Knights Templar amongst other "mysteries"... so check it out!